2015 has definitely been an amazing year so far. Not only did I start a blog (which has truly surpassed my expectations..but that's another post!) , I also managed to PR in almost every distance that I ran this year! I put in a lot of hard work and dedicated myself to training hard, so it was nice to see all of that pay off. Now that the year is coming to an end and all of my big races are over, it's tough to come up with running-related goals. 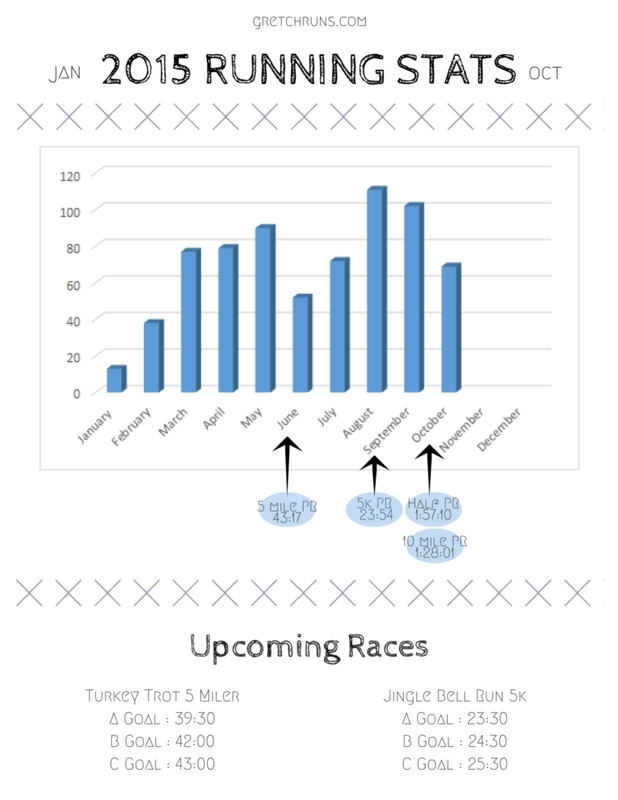 I have two races left in the year- the local Turkey Trot 5 miler and a Jingle Bell Run. I'd love to try to PR in these races and really finish the year with a bang, but I'm just looking forward to getting back to training and running/cross training regularly again. 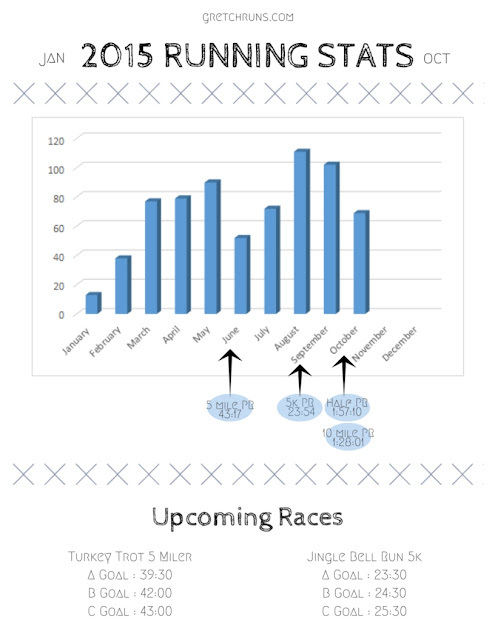 You all know by now that I'm graphic-obsessed, so here's what my year looked like mileage and PR wise, along with my goals for my two remaining races. Along with my races, I have a lot of other goals for the rest of the year. Thankfully, Sweat Pink and Run to the Finish are hosting a holiday challenge! I'll be joining in the Sweat Pink #HolidaySweat Challenge this year! It's my first year participating, but this is actually the 8th annual challenge. There are lots of prizes and community support, so I'm looking forward to getting that much-needed encouragement and support to stay in shape during the holidays! If you're interested in joining, sign up here and use the hashtag #HolidaySweat to post about your workouts from November 8 to January 2! What is your proudest moment of the year so far? Are you running in any turkey trots or holiday races? Who else is joining #HolidaySweat? I was just thinking about end of year goals yesterday. I'm at 1327 miles for the year, so I think I am going to just aim for 1500. It might be tricky because I'm still having a few weird post-marathon niggles. Nothing to serious, but just enough that I still feel like I need a few extra rest days here and there. Good luck on your final two races! A PR in the 5 miler should be pretty easy based on your recent races. That's amazing Heather! It's definitely more important to listen to your body and not push too much just to hit a number, and I know you'll be smart about that. I'm hoping the 5 miler PR will be easy to hit! My current one was an accident..I ran a race on my birthday in Central Park after nearly sleeping through the race and just wanted to experience a race in New York, so I ran by feel and ended up PRing! Did you start your blog this year? I saw the archives dating back form 2011, I wish I would have nominated you for that Liebster award! You are so talented with graphics keep them coming! My proudest moment of the year was mustering up the courage to launch my blog. You wouldn't believe how much encouragement it took! Sorry that's a bit of a long story! I actually "started" a blog a few times...most recent was "Gretchen Goes the Distance" when I was training for my first marathon in 2011/2012. I only posted my training numbers and stopped before I ran my race, so I don't really consider that starting my blog. This year, I bought the domain for Gretch Runs and really started to blog, so that's why you see those old posts, but technically I consider starting my blog in 2015! I should probably delete those old posts because they're embarrassing! Haha I totally understand! I was "Take Heart Marge" for about a year, but didn't even launch it so at least you were brave enough to do that! Look at you and all those PRs!! The big race I've been training for is in a little less than two weeks, but after that the only thing I have planned is a Turkey Trot 5k. HolidaySweat sounds interesting, I'm going to check it out! Wow! Great PR year. You've got some solid goals for the rest of the year! Turkey Trot is my family's favorite tradition! I've been doing it almost every year since I was in middle school! Makes me feel way less bad about eating the equivalent of an entire pecan pie :) Hope you have a fabulous day and congrats on some awesome PRs! Such a great tradition! And yes- race early in the morning = no guilt eating later :) Thanks Jamie!! It's not a turkey trot but I am doing a 5k the weekend before Thanksgiving. Thanksgiving is usually early afternoon so I'd feel rushed if I did a turkey trot. The weekend before allows me to relax a little bit. That's a really good idea! If I was hosting Thanksgiving I would probably do the same thing. You've had an amazing year! Congrats on all those PRs! My proudest accomplishment this year was learning how to swim (I was a total water-phobe) and finishing my first 3! tris. Thank you! And that's a HUGE accomplishment! You should be very, very proud! I didn't have a Turkey Trot on my list...but I'm looking into it now. For as many races as I've run, I've only ever run ONE 5K, and I ran 3 marathons before I did that. Haha. Sadly, there don't seem to be many options near where I'll be for Thanksgiving. Proudest moment of the year? Well, rockin' my first tri was a proud one, but the proudest...my brother and I climbed Mt. Kilimanjaro in January, and it was incredible! Love all your running graphics, BTW. Wow, what a year you've had! That's absolutely amazing that you climbed Kilimanjaro..not a lot of people can say they've done that. Way to go!! And thank you! I'm not registered for any races but you definitely gave me the idea to check some out! I really do need to run one of the shorter distances soon just to keep up that part of my fitness. I love using shorter races as my "speed work"! It's much better than running alone, and sometimes (rarely) I even get a medal out of it! You have had quite an awesome year! I want to run a turkey race but never see one available all that close to me. We may go to the parade this year as well so that would kinda be a conflict anyway I guess! what a year! that is awesome. i have always wanted to do a turkey trot or something. i might have to check out what is happening in my city. the holiday sweat thing sounds super fun! definitely signing up. Great job in setting a PR with all your distances you ran this yr. I do not have any holiday races this yr. I have a 50K coming up in Dec. Hoping that will be my greatest accomplishment of the yr.
Congrats on the amazing PRs this year! You are rocking it. I'm looking at doing some holiday runs this year- the first time I'll participate. I think it will keep me interested in moving forward during those crazy holiday days. Thanks Patty! I hope you enjoy the holiday races..I always love it! i was just looking at doing a turkey trot yesterday. we are doing dinner for thanksgiving this year instead of lunch like we have in the past. i cook so there is no way i could do a race and have all the food ready in time. That's great that you can do both this year! Good luck! Congrats on all those awesome PRs this year! I love the graphic - I'm definitely a chart person as well and the data is so fun to see. I'm not doing any holiday races, but I'm considering some races early in the year to keep me motivated during holiday travel. I love to see data...makes it seem more "real" and make sense to me! I need to find races in 2016 too..haven't even started looking yet! Hands down my biggest accomplishment is my half marathon PR. I am about 100 miles from my 2015 mileage goal and marathon training starts soon! You definitely had an amazing year full of great accomplishments! I'm so glad I got to know you this year too!! You've had such an amazing year! All that hard work really does pay off. I think my proudest moment this year was finishing my first half marathon - it was almost an emotional experience at the end there. I am planning on running a Turkey Trot 5k down in Sedona... the race organizers have a "Iron Turkey Challenge" for anyone who wants to complete the race while carrying their Thanksgiving turkey, lol. They don't win anything besides the "admiration of your fellow runners". It's really cool to see all of these Holiday Fitness Challenges.. I may just join #HolidaySweat! That's a huge deal Cynthia! I love that idea of the iron turkey..but I don't think I would do it just to get admiration of others. Give me a medal and I'll do anything though! Good luck! I'll be joining you in #holidaysweat as I'm done racing and I need some incentive to keep moving. I did the holiday sweat challenge last year - it was a fun time! Love your goal of 15,000 steps per day, rather than the typical 10. Go Gretchen! My proudest moment this year by far was getting accepted into graduate school! Congrats on a great year of runnning with tons of PR's, that must feel great with all of your hard work! I'm doing the #HolidaySweat challenge for the first time too - I'm looking forward to it! That's really great! Good job! Here is to 2016! You've had an awesome running year. Love the graph. Of course if it's about running I'm going to love it. Thanks for sharing with friends at Fitness Friday!